I like to keep my makeup routine as low maintenance as possible. Having acne prone skin means I like to take the 'less is more' approach and keep things to a minimum but some days I like to go all out and use everything from mascara to highlight. However, I'm the first to admit that I'm not actually great at putting on makeup. My foundation can look a bit dodgy sometimes and I'm guilty of being quite lazy when it comes to reapplying things like lipstick, powder and concealer throughout the day. I'm always amazed by girls (my friend Trina - eyeshadow whizz) who can go a whole day with impeccable looking makeup. Mine always looks a little iffy by the time 6pm rolls around and these days I really only bother with a 'face' when I'm going to work. 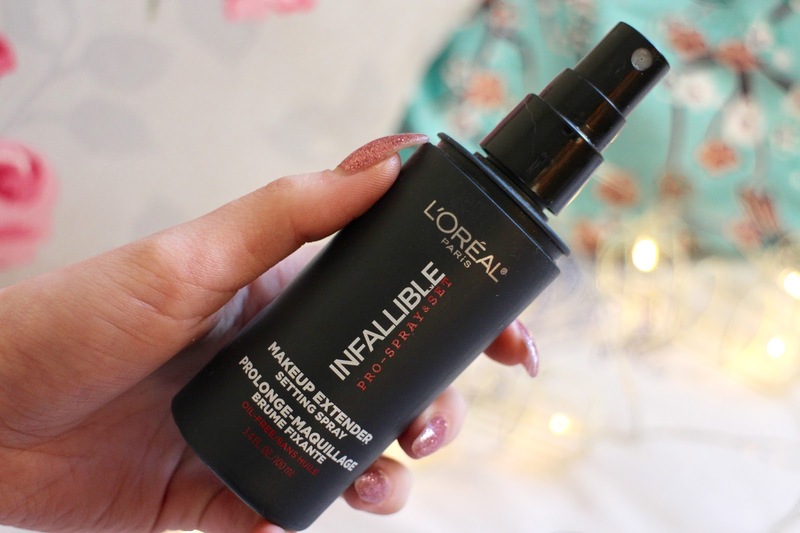 This time last year though, L'oreal launched their 'Infallible' range and I was instantly intrigued. The range promised to deliver 'long lasting' makeup that would keep you going from day to night and would feel lightless and fresh throughout the day. I've bought both variations of the foundation and loved them, but was disappointed to see that the setting spray wasn't available here in Ireland at the time. Naturally with a trip to NYC looming, the L'oreal Infallible setting spray was top of my 'must buy' list and one of the first beauty items I purchased whilst I was over there. I've never used a setting spray before and I was curious to see if it would really help my makeup stay in place throughout the day. First things first, I hate the packaging. It's sort of rubbery which means it gets quite grubby quickly. I also hate the smell of the spray, although it doesn't linger on your skin and you can only smell it when spraying, it's not very nice and reminds me of a household cleaning product. The spray itself I really love. It's easy to apply (I followed the directions on the back) and doesn't feel like you're 'spraying' your face with anything. It applies like a mist and absorbs into your skin quickly. If you don't give it a good shake before using, it squirts and leaves little spots on your face which is a little annoying. I like that it absorbed quickly because if you're in a rush you don't want to be waiting for it to absorb. I was also afraid that it might make my makeup look quite wet and sweaty looking but it doesn't at all. It really does help set your makeup for the day. I've found that the makeup on my forehead and chin lasts a lot longer throughout the day compared to days when I'd completely skip the setting spray altogether and I like that when you do use it, that it doesn't look or feel like you've used any setting spray at all. If you're looking for a cheap, reliable setting spray that doesn't exactly break the bank and is simple to use, then I would definitely recommend the L'oreal infallible setting spray. Especially if you're like me and would rather not have to deal with touching up your makeup throughout the day - lazy gal right here. Have any of you tried this?? Comment below. I'm yet to use a setting spray, but this is the 3rd post I'm reading about them today so I think It's time I invested haha! Great post! I have not tried this setting spray yet I am in love with my Urban Deacy all nighters setting spray. Love your nails by the way!